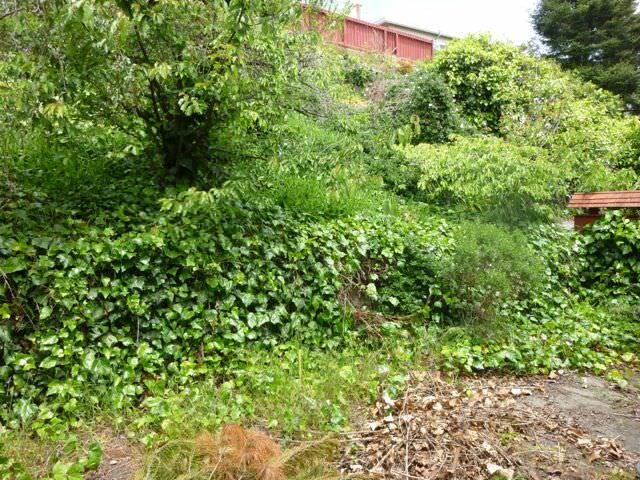 Pressure treated (PT) lumber is the predominant wood material used in San Francisco landscapes where the exposure will be in a wet enviorment or when there is earth/wood contact. 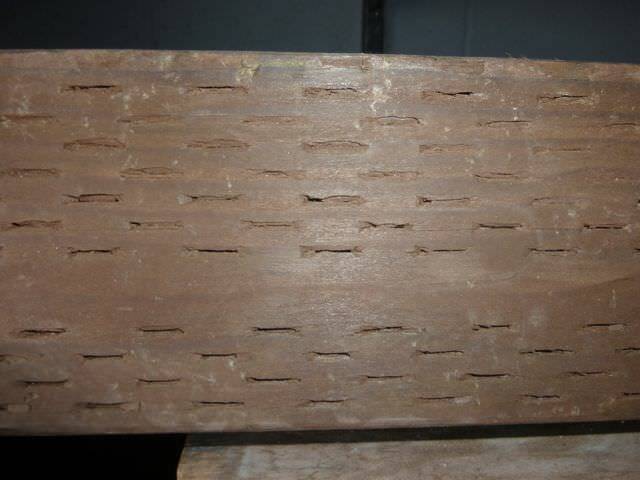 Its identified by a greenish or very brown color with staple size slits on all surfaces except the ends. PT lumber is basically a douglass fir or equivalent lumber that has been infused with preservatives. The preservative used until 2004 for home applications was CCA or chromated copper arsenate with the arsenate component being highly toxic and a known carcinogen. Today we use PT that has been infused with amine copper quat (ACQ) or copper azole (CA) or micronized copper quatemary (MCQ), all products without the arsenate and much safer. Does that mean we would recommend building a raised vegetable planter out of it? Although the manufacturer says its safe, we still would not recommend it. But we at Tamate Landscaping do use it for the structural components of decks and fences since its the most economical and will last the longest. Still there are some options in some applications. 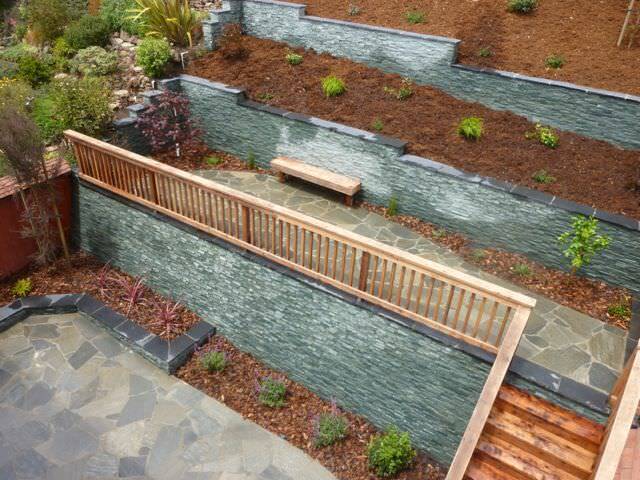 For example, instead of a PT retaining wall, consider concrete. Or for fences, consider all redwood instead of PT structural components. These options will cost much more but they are options none the less. Do your own research regarding these products and feel free to contact us for different options for your specific application. 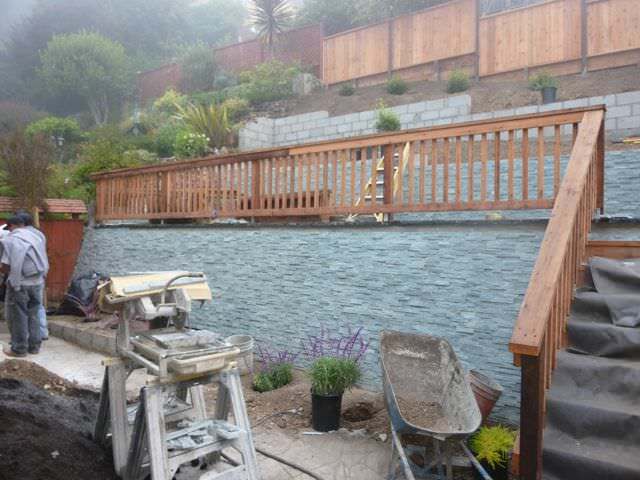 It was decided that for this project we would build a series of retaining walls to create level areas. The picture below shows the end of the 5th day. 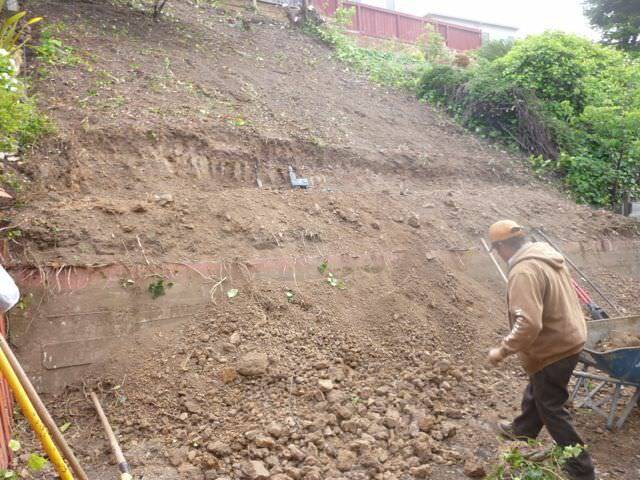 All foliage has been removed, existing concrete pad broken up and hauled away, and the process of carving into the hillside is underway. By the end of the excavation, we removed 40 cubic yards of material or 6 dump trucks. As is typical in San Francisco, all work is done by hand due to limited access. With this job, we were lucky in that we were able to remove debris by wheel barrel instead of the normal 5 gallon Home Depot bucket. Below you see the progress of the project on July 6, 2012, 9 days into the project. 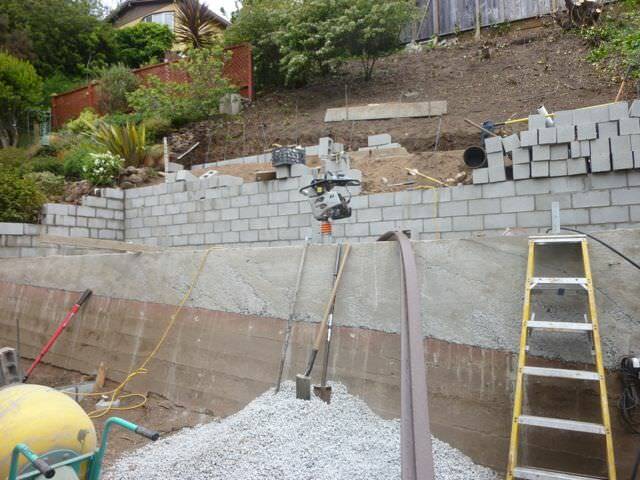 We salvaged the lower existing concrete wall since it was solid. Since it was not built level, we extended it with concrete. Whenever such an extension is added, its important to add steel reinforcement. Before the concrete pour, we drilled holes in the existing wall and epoxied vertical re-bar into the wall and tied horizontal re-bar on to these. In the background, you see additional walls being put up. For wall material, we decided on CMU to save on costs since all concrete work would have to be done in many stages. The walls are finished and below you see us installing a drain behind each wall. Hydrostatic pressure occurs when the water run-off accumulates and puts added weight behind the walls. 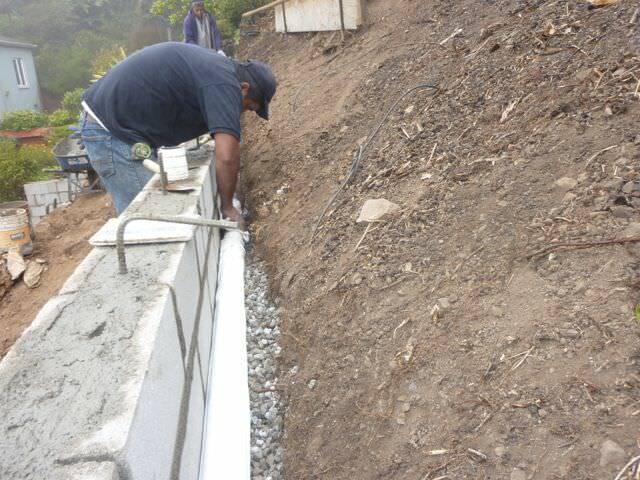 With the weight of water at 8.3 pounds per gallon, an extended rainy season can compromise the integrity of the wall if hydrostatic pressure is not factored in. Our drainage system consist of digging a trench behind each wall, installing a 3″ perforated drain pipe wrapped in fabric, connecting it to the municipal drain and backfilling the trench with drain rock. At day 14 since the start of the project, the black limestone wall cap is installed, stairs stringers are cut and the concrete base for the Silver Quartzite Flagstone patio is being poured. Project Update: End of the 4th week, July 20th, 2012. 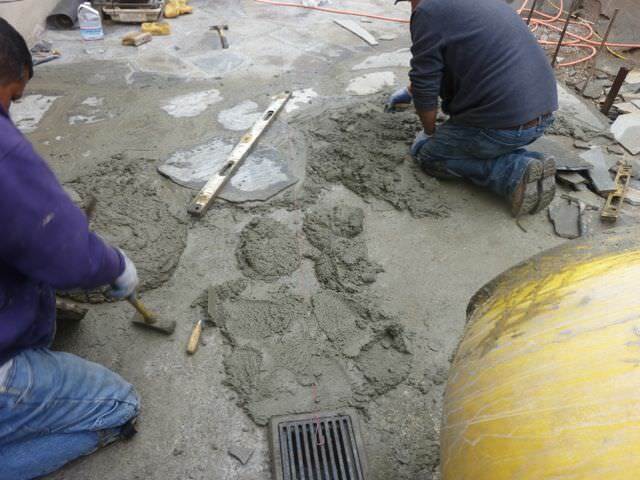 Here you see the the Silver Quartzite Flagstone being mortared in over a 3-4″ concrete base. Each piece is carefully selected and fit into place, kind of like a gist jigsaw puzzle. Silver Quartzite is a favorite at Tamate Landscaping due to its natural characteristics: Its the hardest, most non porous of all flagstones and the colors and patterns will not fade over time. 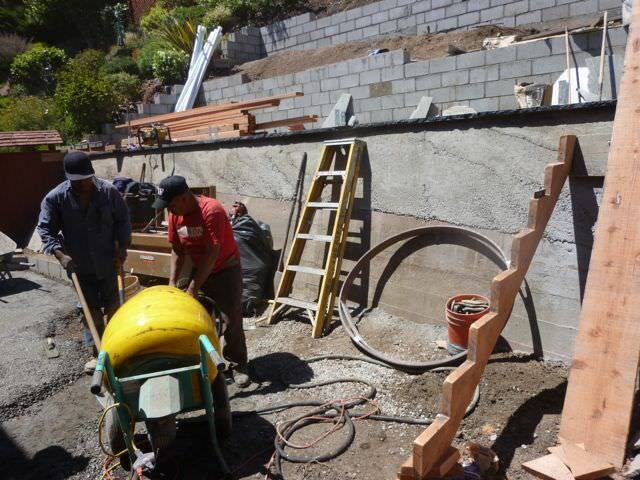 Redwood stairs and safety rails are in, the retaining walls are being veneered with Beijing Green wall panels and planting work has begun.